Ever look at that really fit guy in the gym or in the office and wonder how he does it? He’s the one you can’t help but secretly dislike – just a little bit He’s always full of energy, claims to actually enjoy leg day, most likely spends his weekends hiking in the wilderness with his rescue dog, and has calves so developed you’ve vowed to never wear shorts in public again. With a few little tweaks to your lifestyle, you too can be ‘that guy’. Check out these 8 habits fit guys avoid at all costs to keep them in optimal health and straight-up killing it at life. How many are you guilty of? Life is unpredictable but your fitness routine shouldn’t be. Truly fit people make fitness a priority, schedule their workouts and carve out the time to make it happen. If you can commit to Taco Tuesday every week and never miss a Thursday night $8 Steak + Schooner deal, you can find time to train on a regular basis. Pack your gym bag, steel yourself for missing that night’s episode of Keeping Up With The Kardashians and cut the excuses. Soon it’ll be so ingrained in your routine it’ll happen without a second thought. Tired? Listen to your body and put that bed to good use – sleep in it. Fit people know a good night’s sleep of 7-8 hours is a secret weapon. Lack of shut-eye kills your metabolism, your mood and your brain power, and will guarantee a sub-par performance in the gym (if you can even drag yourself there). Big nights that stretch into whole weekends, weeknights spent binge-watching entire seasons on Netflix, levelling up until the early hours of the morning and powering through on several coffees isn’t getting you anywhere fast. Top athletes will rarely skip a morning meal, and these guys know a thing or two about being fit. Studies have shown that breakfast eaters have more energy, lower cholesterol and are leaner and healthier all-round than breakfast dodgers. If you’re one of those “Not hungry yet” people of a morning (as opposed to those who view sleep purely as a time machine to breakfast), try starting the day with a light shake or smoothie. Check out Vitalstrength 100% Whey for the high-protein, low-fat, low-carb option. Quickly blend with half a banana, berries and a tablespoon of natural peanut butter for a more satisfying on-the-go breakfast. Sure, you can rely on your own willpower and determination but fit people know that having a strong support system can help them to stay on track. Find a mate, colleague or training partner that motivates you, spurs you on and helps keep you accountable. There’s nothing like a little healthy competition to make you squeeze in an extra workout, lift a little heavier and say no to the biscuit tin at work. It’s surprising what the stubborn male mind and body can achieve when pride is on the line. To consistently function at a high capacity, whether it’s at work or in the gym, proper hydration is vital. Fit guys always keep a bottle of water within reach – on the work desk, in the car, at the gym – ensuring that they naturally increase water intake. Remember, thirst is not a reliable indicator of hydration. By the time you actually feel like taking a swig of water, you’re already at least 2% dehydrated, which is enough to begin impairing athletic performance. Losses in excess of 5% of body weight can decrease the capacity for work by about 30%. Why risk it? Man up and drink. We all experience stress but the difference lies in how we deal with it. Some people eat entire packets of chocolate biscuits or down glass after glass of Scotch while others find healthier ways to deal with stress without taking it out on their bodies. Try going for a walk, a brutal boxing session or watching your favourite stand up comedian on YouTube. Yoga and meditation more of your style? Find what works for you and go with it. Even the toughest of blokes can benefit from a relaxing bath now and then to wash away the day’s worries. Fit guys cheat – on their diets and their workouts. Being fit isn’t about being perfect but instead finding a balance that enables you to enjoy life to the max, including all its vices. 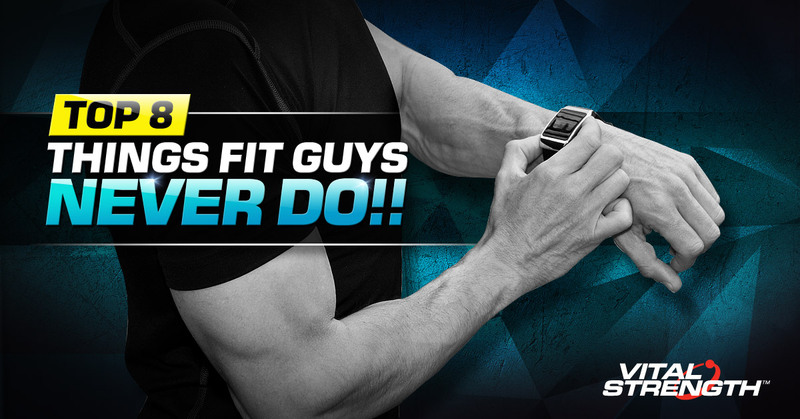 Even the fittest of guys will skip a workout and down a burger with extra fries now and then. The key is that they don’t beat themselves up about it. Enjoy every greasy mouthful, every refreshing sip of beer and every lazy minute on the couch, then pick yourself back up and get on with it. Now that you know what to do, and what not to do, it’s up to you. Only a few simple changes stand between you and a fit lifestyle that even Tom in Accounts with the perfect calves would be envious of.